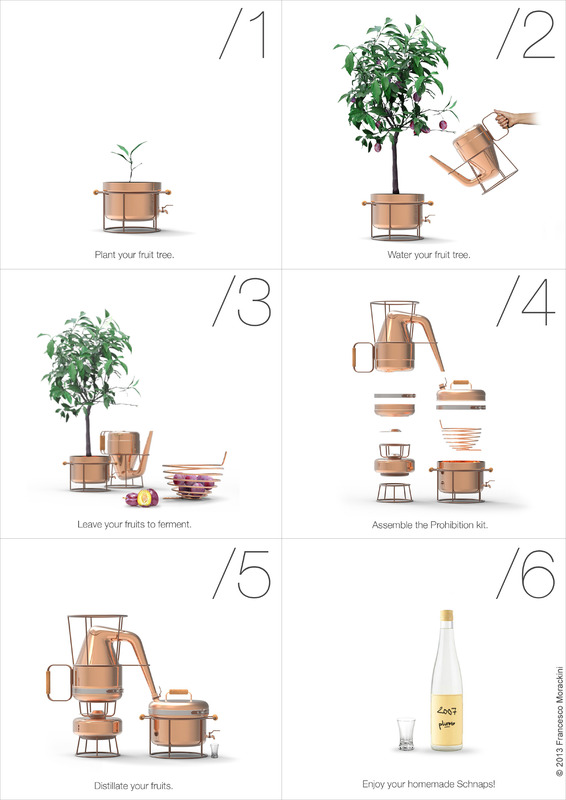 Designed by Francesco Morackini, the Prohibition kit is composed of four perfectly legal objects: a watering can, a fondue stove, a cooking pot, and a fruit bowl. But once combined together, they create a still to produce your own homemade schnaps. Distilling alcohol without a license is illegal in most countries in the world… Because of its legislative issue, the Prohibition kit is deliberately a provocative project. I want to question the people about the value and purpose of everyday products surrounding us. I propose another point of view to observe them. When are innocent products becoming illegal? What can those products do for us, or what do they do to us? The kit presents us with a question–when should having the tools that lets you do something illegal be in itself illegal? This is a question that’s at the core of what it is to be a maker, because with the right tools you can do anything, and tools don’t just serve a single purpose. Take lock picks for instance, or better yet, the 3D printer. When you can make a gun with a 3D printer, and owning the gun is illegal, should the printer itself be illegal? Most people would say “No!” but the question of where you draw that line in an interesting one.